The story of Susannah and the Elders forms the 13th chapter of the Book of Daniel in the Catholic Bible. The Protestant churches do not consider it canonical, and thus is not included in their Bible, although it did appear in the King James version of 1611.
demonstrate that they had lied. The assembly then condemned the elders to death, and Susannah was exonerated. This scene is often displayed in government-related contexts as a reminder to judge wisely and honestly. Susannah is depicted fully clothed, which is the medieval tradition. In Renaissance depictions, she is usually depicted naked. Susannah is seen in the foreground, off centre, sitting in front of a well, her right hand catching water spilling from the top of the fountain. To her left is an opened chest. Emerging from the left with hands raised towards Susannah are two elders in pointed headwear. Behind the main scene is a castellated townscape with two women in long gowns talking to each other in the back right. The whole roundel executed in black/brown pigment and yellow stain. Formerly in the Soulages collection. The story of Susannah and the Elders forms the 13th chapter of the Book of Daniel in the Catholic (Vulgate) Bible. It is considered non-canonical by the Protestant church and thus is not included in their Bible, although it did appear in the King James version in the early 16th century. Susannah was the notably righteous wife of Joachim of Babylon, a wealthy man. Joachim permitted his garden to be used by the wise elders of the community as a place where they could meet and discuss the legal matters of the land. It was there that Susannah came to the notice of two of these elders who hid in the garden until Susannah's two maids left to fetch her washing things. The elders threatened to expose Susannah, falsely, as an adulteress if she did not sleep with them. Susannah chose not to sin and refused their advances. The two elders denounced her in a public assembly. The assembly called for her death for they believed that the judges could never lie because of their age and their position. Susannah prayed to God who sent the wise young Daniel to arbitrate on her behalf. By separating the two elders and getting contradictory testimony during cross-examination, Daniel was able to demonstrate that they had lied. The assembly then called for the death of the elders which was carried out and Susannah was exonerated. Susannah is depicted fully clothed which is the medieval tradition. In Renaissance depictions, she is depicted mostly naked. 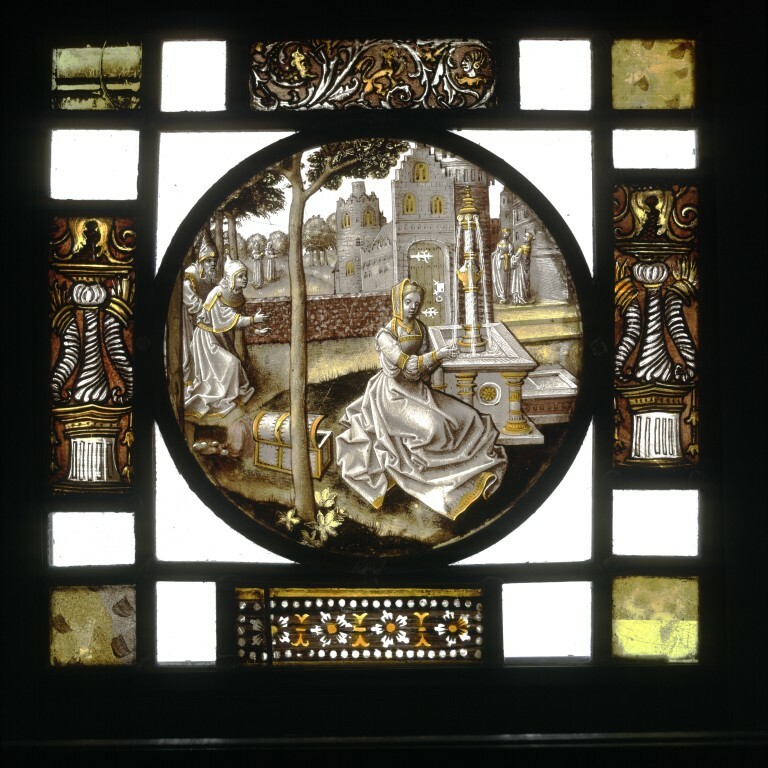 Painted and stained glass roundel depicting Susannah and the Elders at the Well. Made in the Netherlands, c.1520-40.